What happens when Amazon opens an office in Canada? Amazon has 3,178 employees in Canada. That’s 22% more than Shopify, Canada’s pride and joy, employs at home. Of these Canadian employees, Amazon employs over 2.5 times as many Software Engineers as our Narwhal. Every time the media announces that a foreign company is creating jobs in Canada the reaction is positive. This news is flattering to our egos and promises jobs aplenty, but is it a good thing? Canada’s unemployment rate is low, but it’s not zero, so it makes sense to want more jobs. The problem is that Canadian employers want the same sought-after skills that foreign employers want. To put this supply and demand into perspective, Canada is expected to have almost a quarter million more tech jobs than tech professionals by 2020. Why then is our government subsidizing foreign employers with tax credits so they can poach talent that could be working for Canadian companies? The presence of foreign employers in Canada has its merits, but it isn’t necessarily good for our innovation. Foreign employers aren’t coming here for altruistic reasons. They come in search of talent that could just as easily be working for a domestic employer with the potential to create long-term wealth and self-sufficiency for the nation. Last year, Vancouver imposed a tax on foreign buyers of its real estate. The intent was to slow the city’s meteoric rise in house prices; the influx of buyers from out-of-country had driven prices beyond the reach of Vancouver residents. Not long afterward, Toronto followed suit. In both cities, the tax served to slow the rising housing prices and give local residents a fighting chance to win the bidding wars. Not only are foreign employers turning our talent pool into a puddle, their presence is making talent more expensive. If a protective tax impacts the price of real estate, it could do the same for human resources. At the very least it could serve to level the playing field between a strong USD and our native currency. While real estate has been cooling down, Trump has been busy imposing tariffs on Canadian steel and aluminum. Trudeau has reciprocated with a similar steel tax, but I would have gone a different route. If it makes sense to put a tariff on raw and finished products, why not talent? If foreign companies are generating wealth by means of Canadian talent, why shouldn’t we claim a piece of it? 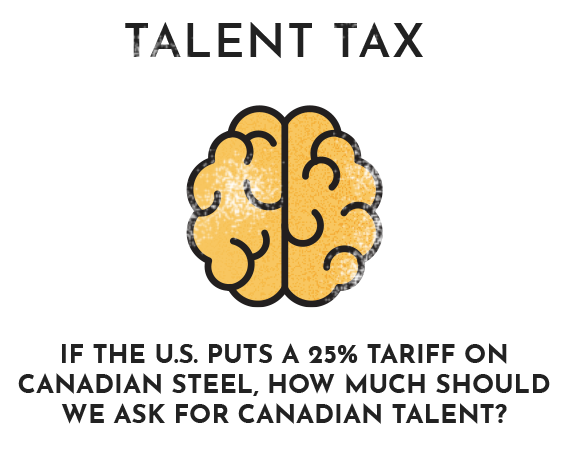 Canada hasn’t seen a trade war, but we’re on the verge of a talent war. It’s time for our leaders and politicians to think about how to best arm our innovators and entrepreneurs. If they don’t, it’s conceivable that Canada could become an offshore dev shop. What do you think is the best course of action?